Tesla, Edison, Jobs are names we all know well. We associate them with inventions which forever changed our lives. However, hundreds of years before them lived an inventor the likes of which we have not seen since and may not see again (ever). That genius was, of course, Leonardo da Vinci. Aeronautics, architecture, art (The Last Supper, Mona Lisa), biology, engineering, geology, physics…these are just some of the fields in which da Vinci made ground-breaking/significant contributions. We know this because he kept detailed notes of his thoughts and the results of his frenetic investigations in volumes and volumes of notebooks. While many were lost and/or destroyed after his death, a good number of them survived. 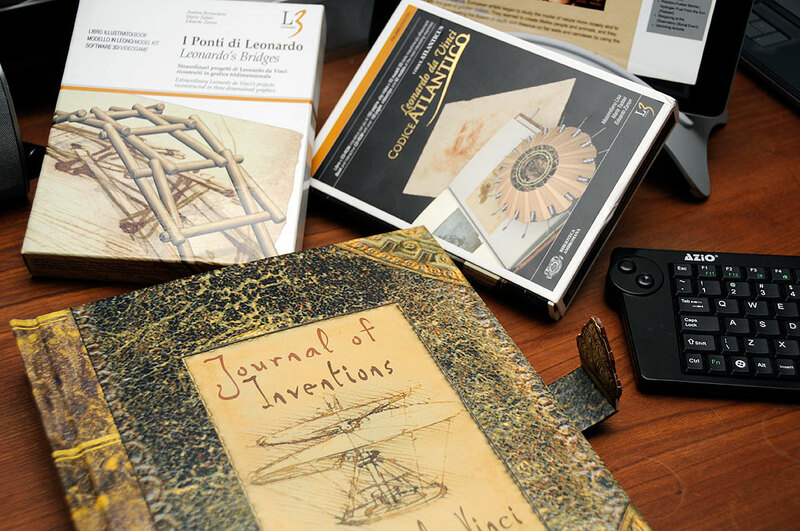 After watching a British TV show about a group of aerospace engineers trying to build a da Vinci ornithopter based solely on the sketches from his notes, we got interested in what else was in his notebooks. The Mechanics of Man by Clayton and Philo is a gorgeous book on da Vinci’s sketches of his investigation of the workings of the human body. These drawings are not just some of the best works da Vinci ever created, but they may very well be some of the best anatomical renderings ever created. Ev-er. Some of his insights are still inspiring and influencing surgeons and medical device makers today. Created by Martin Kemp for the exhibition at London’s Victoria and Albert Museum, Leonardo d Vinci: Experience, Experiment, and Design offers Kemp’s unrivaled insight into the workings of the artist’s visual mind. With this book, the reader can begin to understand Leonardo’s sense of awe when investigating the wonders of nature’s design. For those looking for the most comprehensive survey ever made on the subject of Leonardo da Vinci’s painting, sculptures, architectural drawings, engineering sketches, and scientific renderings, Nathan and Zoller’s dual-volumn set Leonardo da Vinci: The Complete Paintings and Drawings, published by Taschen, is the one that should at the top of the stack. With huge, full-bleed details of Leonardo’s masterworks, this XXL-format (in the hardbound edition) publication allows the reader to get up-close and investigate the subtlest facets of his works. 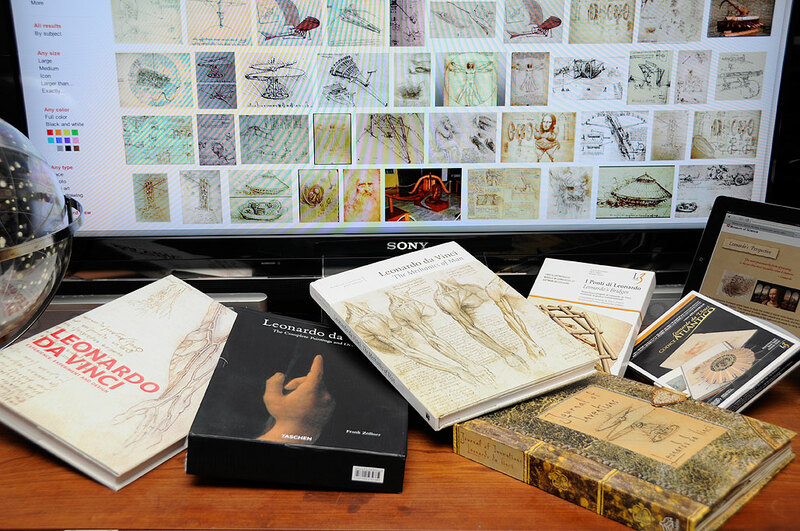 The Codex Atlanticus created by Leonardo3 is an interactive book on CD-ROM with over 150 pages of one of Leonardo’s most fascinating codex. Also on the CD-ROM are video-clips and 50 3D models of the his fascinating machines. The Leonardo’s Bridges is a book accompanied by a wood model of da Vinci’s self-supporting bridge. Building the bridge is a great way to the design come to life. Of all the books, the most incredible has to be Jaspre Bark’s Journal of Inventions: Leonardo da Vinci. It is an amazing collection of six pop-ups and illustrations based on da Vinci’s notebooks and sketches. It is an ingenious way to showcase the brilliance of the 15th century Renaissance inventor/thinker/tinkerer. What could a man like Da Vinci have dreamt up, created, or accomplished if he had available the technologies that exist today? The mind boggles at the thought and the heart skips a beat with excitment at the possibilities. In the meantime, if readers have a personal da-Vinci-book favorite, give us a ping. We will be happy to take a look and to pass on the suggestion.